Maria Mirovska was born in the city of Kharkov (Ukraine). She started her music lessons at the age of 6. Her first performance with Kharkov Philharmonic Symphony Orchestra was when she was 11. 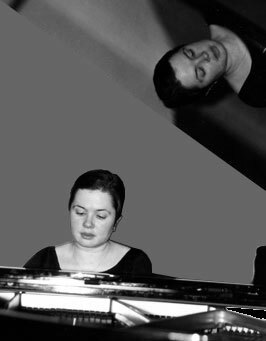 In 1987 she won I prize in All-Ukrainian Young Composers' Competition. In 1990 Maria entered Gnessins' State Musical College in Moscow, and graduated the college in 1994 (Diploma with distinction), teachers — Alexander Basilov, Andrey Khitrouk. In 1995 she became a student of Russian Academy of Music (RAM) named after Gnessins (professor — Laureate of International Competitions Ekaterina Derzhavina), and graduated the Academy in 2000 (Diploma with distinction). During her studying in Academy she regularly took part in Piano Faculty concerts, class concerts. Right after graduating the Academy she became an assistant (post-graduating course) of professor RAM named after Gnessins, People's Artist of Russia, Arcady Sevidov; finished post-graduating course in 2002. Maria was an active participant in master-courses of Professor Walter Blankenheim (1996, 1997), Professor Dmitry Bashkirov (1999), Professor Klaus Hellwig (1999, 2001). Her first recital she has played at the age of 14. Since 1998 cooperates with chamber collectives in Moscow State Academic Philharmonic and others (“Moscow Classic Ensemble”; ensemble of ancient music “Excellente”: the art director – People’s artist of Russia Eugeny Nepalo; “Glinka Academy of soloists”; Association of Moscow musicians “Ad libitum”). She plays regularly recitals in cities and towns of Russia, Ukraine, Germany, Switzerland, and Spain. In 1998 she has recorded works of Mozart and Chopin on Radio Bern (Bern, Switzerland). In November 2006 M. Mirovska performed for the first time in Kharkov Fantasy for piano and orchestra “Africa” of C. Saint-Saens (the Academic Symphonic orchestra of Kharkov philharmonic society, conductor — the People’s artist of Ukraine Alexey Gulyanitsky). M. Mirovska has presented a lot of chamber programs in a duet with the Honored artist of the Russia, Gleb Karpushkin (French horn), and also in ensemble with international competitions’ winner, soloist of Kharkov philharmonic Marina Chizhenko (soprano). She performed at the concert presentation of a French-made harpsichord Marc DuCornet on November, 8, 2007 in Kharkov philharmonic society. Repertoire of M. Mirovska includes works of J. S. Bach, K. Ph. E. Bach, Soler, Scarlatti, Clementi, Mozart, Beethoven, Haydn, Schubert, Chopin, Schumann, Liszt, Brahms, A. Webern, Debussy, Ravel, Granados, Albeniz, Morel, Martinu, Bortnyansky, Rachmaninov, Mussorgsky, Tchaikovsky, Scriabin, as well as modern authors: Eshpay, Ptushkin, Stetsiun, V. Block, Mikita, Nezhigay, Donnik, Rachevsky, Timofeyeva-Rousina, Dyachenko.